I can’t lie. 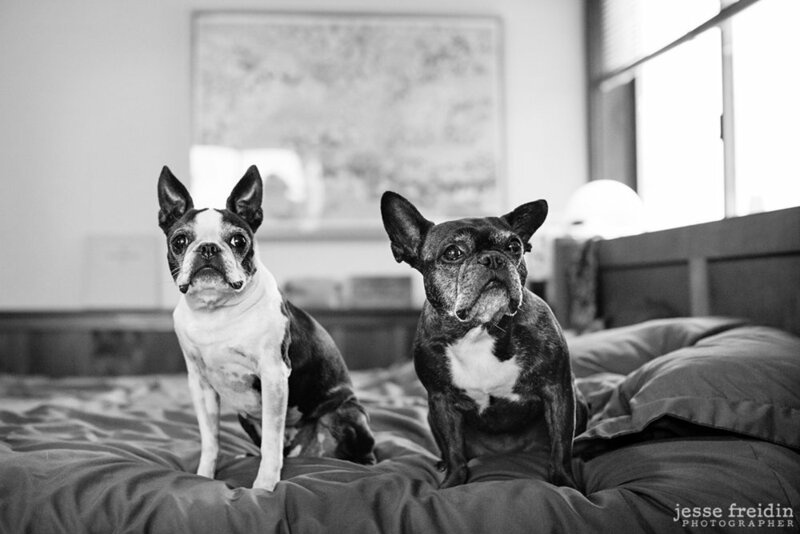 I love Boston Terriers and French Bulldogs. A lot. I’m quite partial to all bully breeds and this fine art dog photography session in Berkeley, CA was amazingly fun for a lot of reasons. 4) My client works at the Ansel Adams Trust. This was a huge one. Her job centers around taking care of the work of one of my photography heroes, Ansel Adams. She scrutinizes the detail and quality of some of the world’s most renowned black and white photographs, and deeply understands the value of high quality print production. 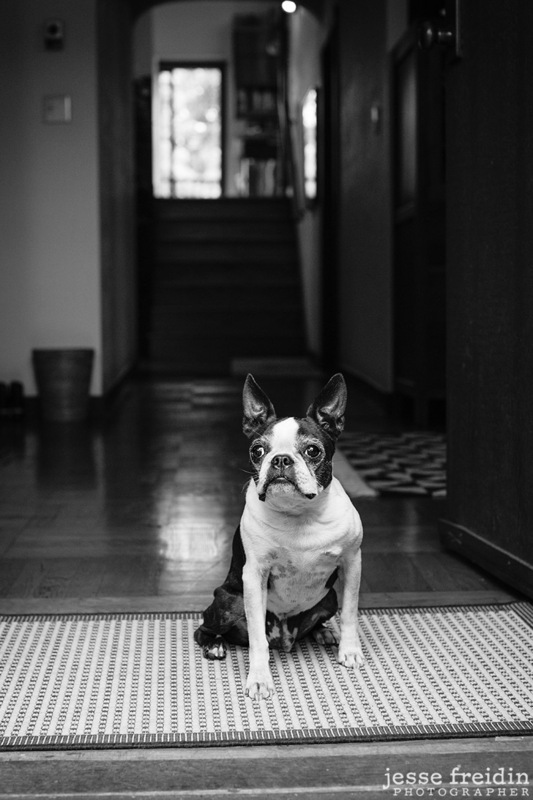 For those reasons, I was honored when she commissioned me to photograph her beloved Dapper and Miso at her home just outside San Francisco. Dapper and Miso are your typical dueling siblings - they have a love/hate relationship with each other. Getting to witness that complicated bond was a lot of fun, and kept me on my toes during our dog photography session. I utilized the beautiful overcast light in the back yard and back patio, where the dogs usually like to sun themselves. I had a great wooden textured bench to use as a platform - I like to place dogs on objects like furniture to give them physical stage on which to perform. I guide them into/onto the platform I want to use, make sure they are safe and happy there, and then step back and simply observe. And photograph. Quite, usually. That’s how I made this series of great black and white dog portraits, including a few great family portraits for my client which they loved. This family portrait was turned into smaller gift prints for their respective families, and of course one print for their home. 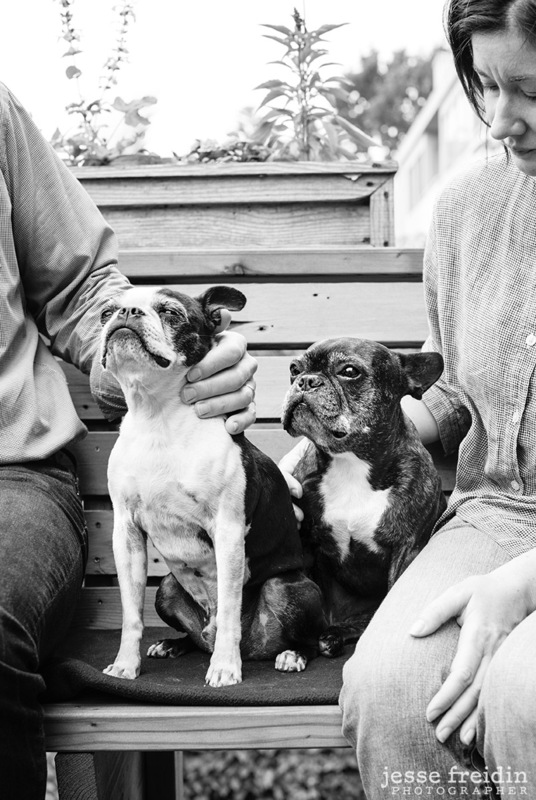 We also selected portraits of Dapper and Miso solo which will be installed in their kitchen/main living room so that they can be enjoyed every morning and every evening while the dogs snooze in their dog beds beside the kitchen table. Couldn’t ask for a better out come than that. Thanks Dapper and Miso. You are very good dogs. And thanks to my client who, on my way out, gifted me two beautiful Ansel Adams books. What a special gift! I was so excited to bring these books home to add them to my art book collection - especially since I have a fairly large Ansel Adams book collection already. What a great gift.